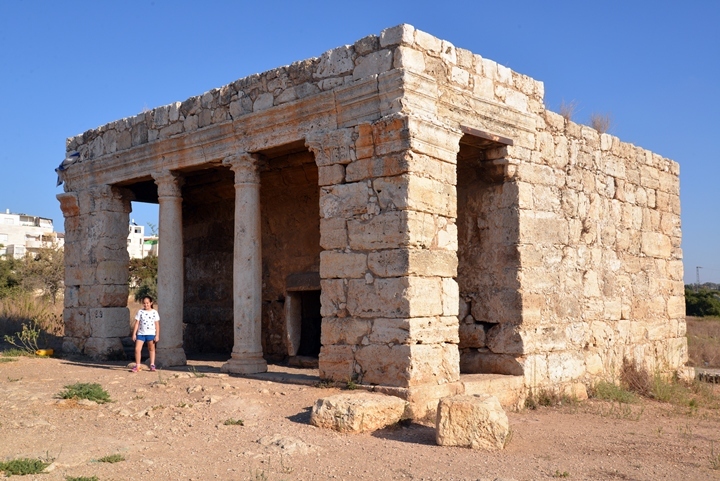 A Mausoleum, dated to the Hellenistic and Roman periods, is one of the oldest standing structures in Israel. The structure is situated close to the Via Maris cross road, near the modern settlement of El'ad and Moshav Mazor. 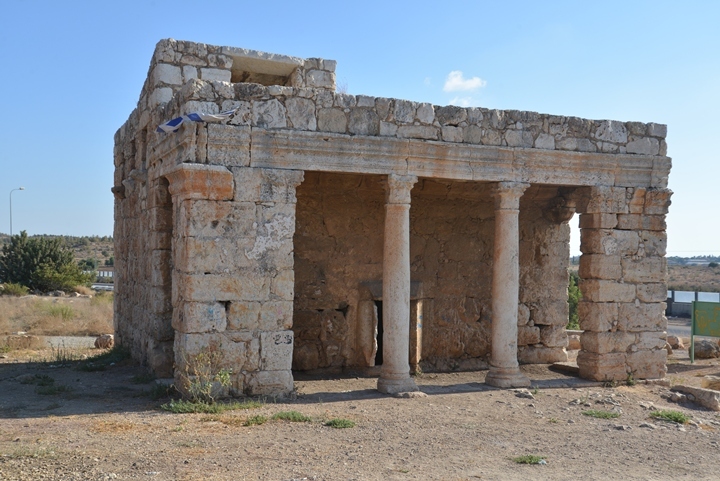 The Mausoleum, a monumental structure enclosing a tomb, later commemorated John the Baptist (and named by locals as Neby Yahyah - St. John). 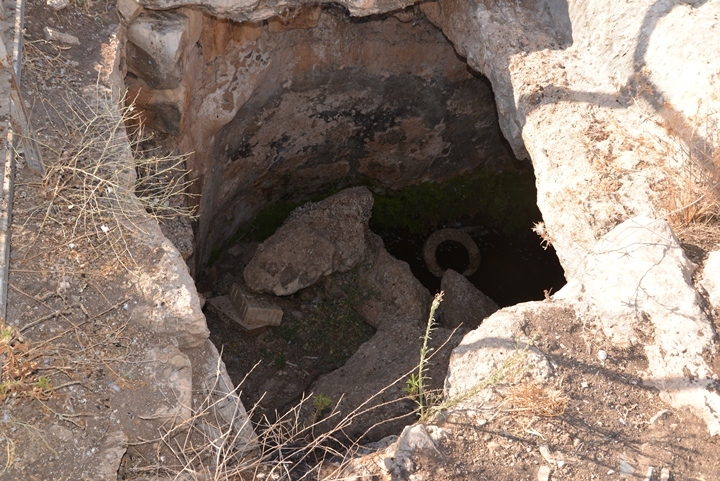 The site is located at a height of 80M, near the ancient route of Via Maris south of the Afek pass. An aerial map of the area around the site is shown here, marked with the major points of interest. 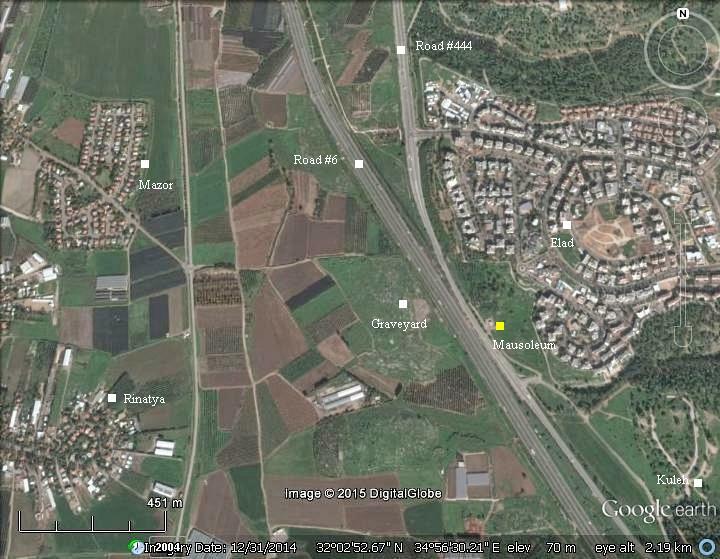 The site is located close to Road #6 (Israel's cross highway), but the access is thru road #444 south of Elad. The structure was built during the Hellenistic period. 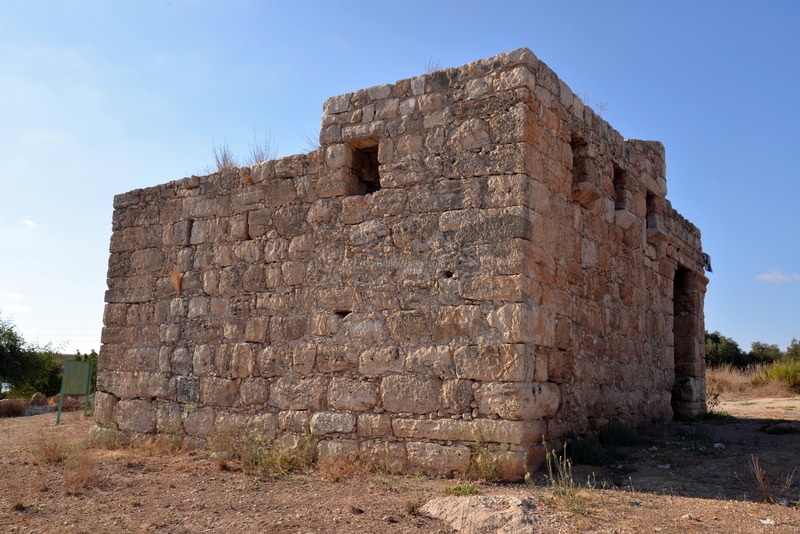 It was later modified during the Roman period (at about 300 AD), as its architecture follows similar structures of the late Roman period that are found in Syria. The tradition of a monument commemorating John the Baptist may have started in the Byzantine period. Later, the Arabs continued to dedicate the structure as a shrine to St. John, as he is regarded in the Quran as a prophet. They named it Makam en Neby Yahyah, or the "shrine of John the Baptist". 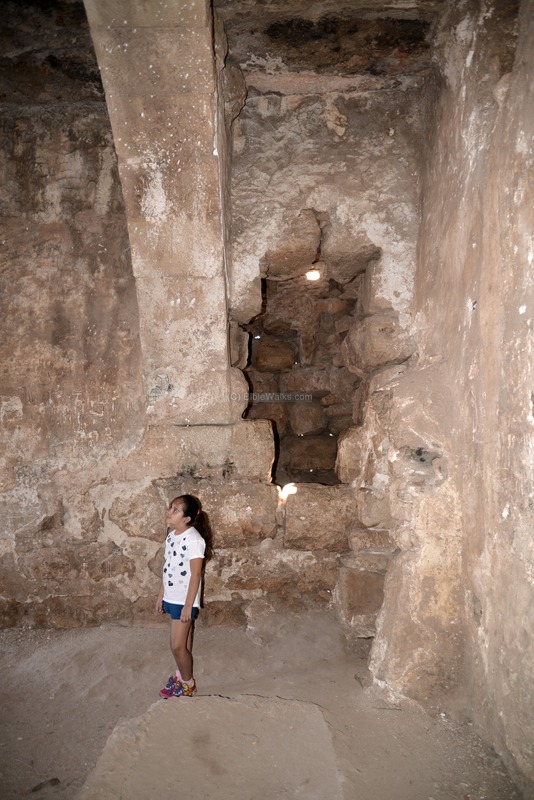 "Makam en Neby Yahyah —One of the most curious monuments in the country. It was visited by Consul Finn in 1848 and 1859, by Major Wilson in 1866 , by the Survey party in 1872 and 1873. At the latter visit a plan and sketch of detail were made. The building has its entrance on the north, and has a bearing along the facade of 73 degrees. It consists of a portico and a square building, including two chambers. The portico measures 30 feet by 9 feet 6 inches outside; the rest of the building 30 feet by 24 feet. The western chamber is 15 feet broad, the eastern 8 feet, interior measurement. The main part of the building is 14 feet 8 inches high to the roof, which is complete, but the eastern chamber has its roof 2 1/2 feet higher. The pillar shafts are 9 feet long. The portico has two pillars and two piers, with Corinthian capitals supporting a cornice. It seems probable that a second story stood above the roof of the building, or at least a parapet wall. The moulding of the little door was the most curious feature of the building, and unlike any other monument found by the Survey party. These details are all given on the plans. The door is only 3 feet 10 inches wide outside, and 3 feet 6 inches inside ; 4 feet 8 inches high outside, 5 feet inside the wall, 3 feet 6 inches thick. The material of the walls is hard stone, but the masonry is roughly hewn, and not in all cases squared ; small stones are used in places in the thick joints, with white mortar mixed with pieces of pottery. The masonry of the porch is better, being squared, but the height of the courses is irregular. The whole is much worn with age, and of a deep yellow colour, like that of the Haram wall at Jerusalem. The walls appear to have been repaired in parts, and the roof, perhaps, also. 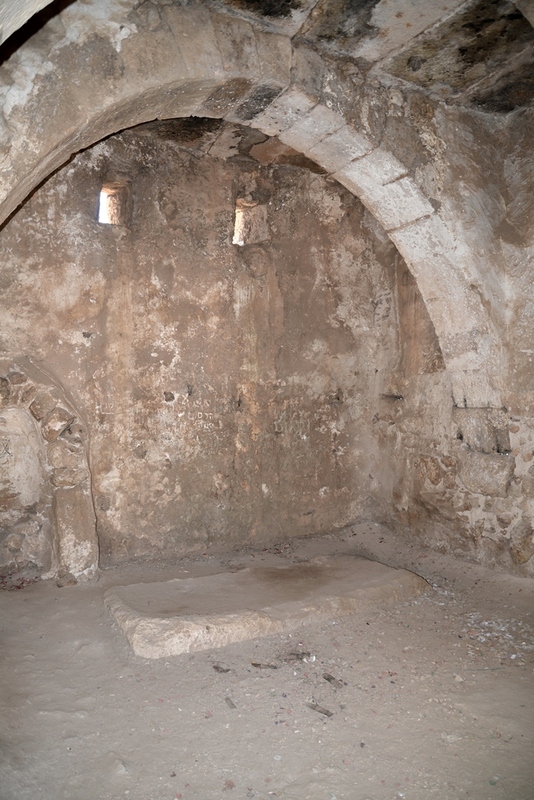 In the western chamber there is a cenotaph and a mihrab. These are both evidently modern additions, and no part of the original design. The roof of the western chamber is supported on two semicircular ribs of 19 voussoirs each. The key-stones are the smallest, the haunch-stones the largest, as in Byzantine buildings. On these ribs, 15 feet span, and about 2 feet wide, the flat roofing slabs are laid in three rows of six each, north and south. The eastern chamber is roofed with six slabs. A staircase leads up the east wall of the east chamber inside ; it consists of flat slabs built into the wall, of which seven remain. They lead up a height of 10 feet 10 inches to a window, of which there are three on the east wall of different heights. The rest of the staircase was, perhaps, outside, but there is also an opening to the roof on the north. The slabs on the roof are covered with a very hard cement mixed with pounded pottery. 1st. The order of architecture, which appears to be debased classic style, such as date to the early Christian period. 2nd. The fad that the roof is of the same date with the buildings which seems indicated by the method by which it is supported on the crosswall and arches. 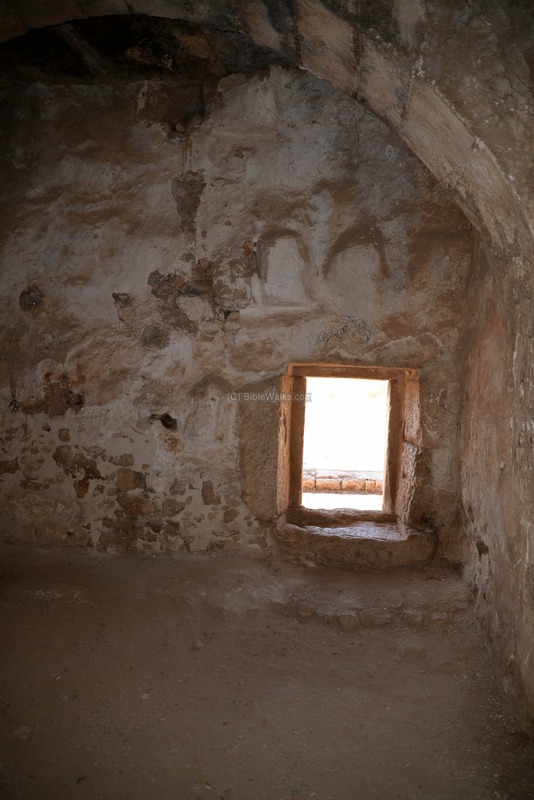 The cross-wall is then part of the original design of the structure. 3rd. The arches of the roof are semicircular, with narrow key-stones, as in fifth century buildings. 4th. 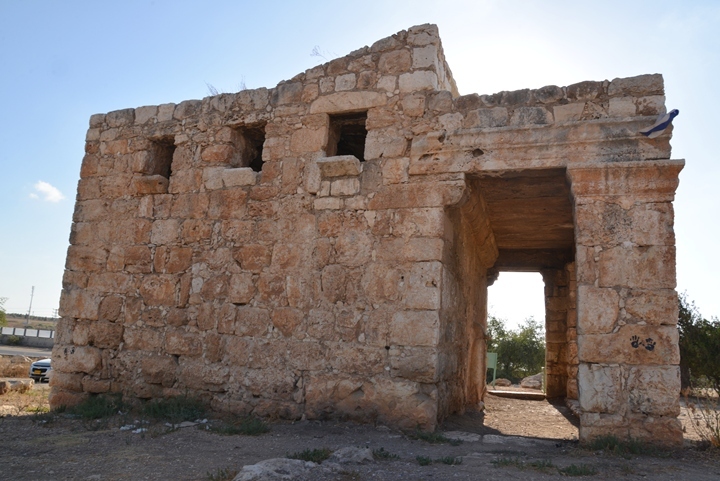 The general arrangement of the roof (which is that used in modern houses in the north of Syria), is also found in the ruined buildings of the Hauran and 'Alah districts, which are attributed to the early Christian period. 5th. Native tradition connects the place with St. John Baptist, who had a church at Mejdel Yaba, not far off. A section of the survey's map, part of Sheet 14, is shown above. The site is to the left of the El Mezeirah village (the meaning of the Arabic name is "the sown land"). The report also includes a short description of the village at that time: " El Mezeirah - A mud village on the edge of the hills, near [Kuleh]". The archaeological survey identified pottery dated to the Roman/Byzantine and the Early Arab periods. Today the site is open free to the public. 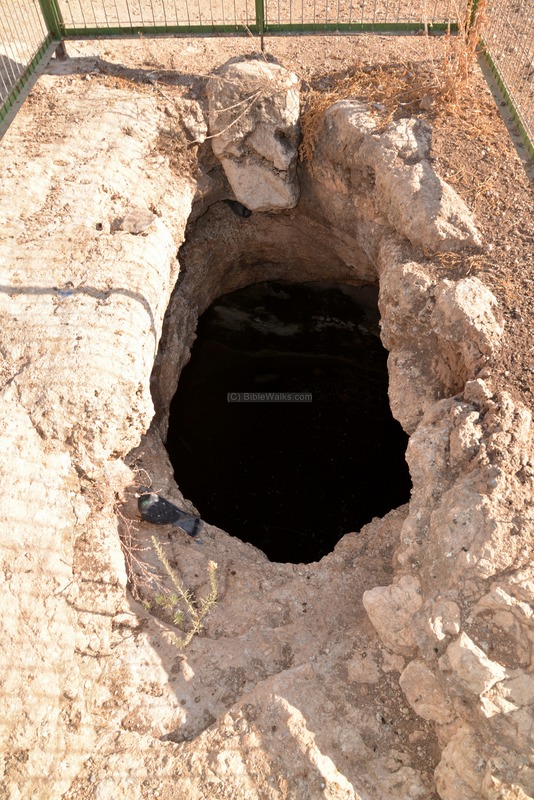 It is on the side of the main road #444 from Elad to Shoham, and is easily accessible. You can combine a short visit to the site with a hike or picnic in the National park of Qula, and visit the remains of its Crusaders fortress. This quadcopter aerial photo shows a view of the Mausoleum from the north east side. The mausoleum consists of a portico (porch leading to the entrance of a building) and a square building. 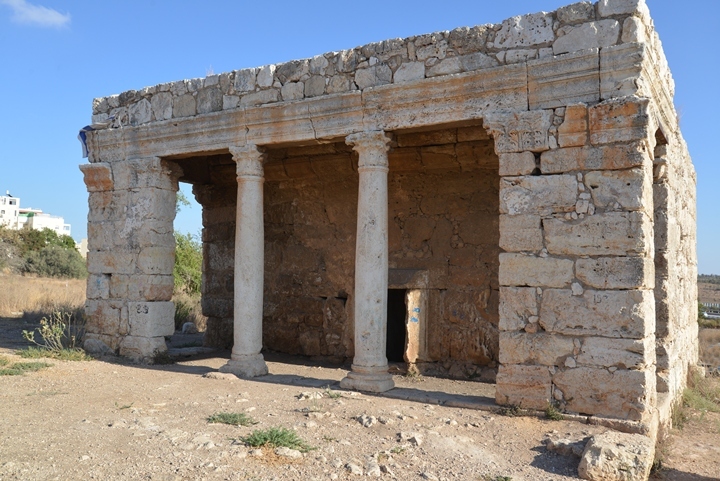 The building behind the portico includes two chambers - the main hall in the western (right) chamber and a smaller chamber on the east (left) side. A staircase on the eastern chamber leads up to the roof of the building. The size of the portico is 2.9m (9'6") by 9.14m (30'), and the building structure is 7.32m (24') by 9.14m (30'). The portico has two pillars and two piers, with Corinthian capitals supporting a cornice. The front is 4.8m high. On the eastern side (right side of the photo below) and southern side (left side) are windows, located close to the roof. Notice the flat stones in front of the eastern windows. 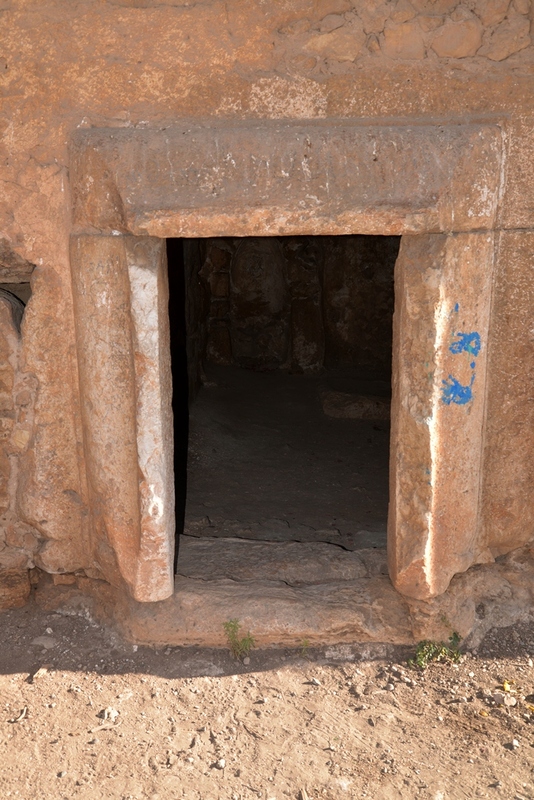 A narrow (1m) opening is located under the portico on the northern wall. 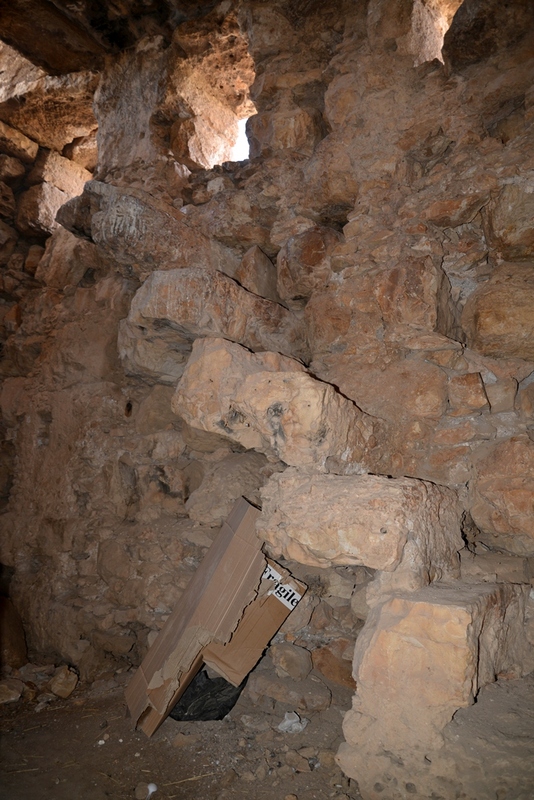 A view of the northern wall is seen below from the inside. The entrance opens up to the western chamber of the structure, which is the main hall. A heavy stone door once stood there to block the entry. The southern side of the main hall is seen in the following photo. In the center is a base of a sarcophagus (stone coffin) which is a cenotaph (an empty tomb erected in honor of John the Baptist - Neby Yahyah). 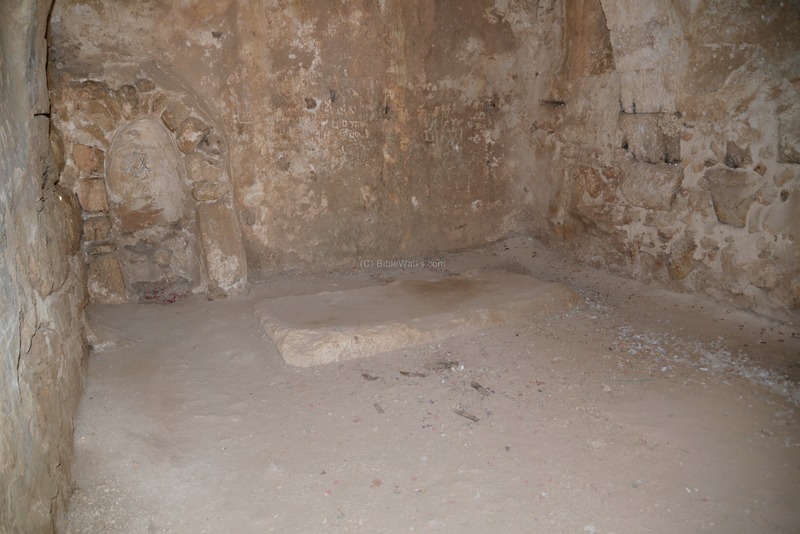 Another smaller perpendicular base of another sarcophagus may have been a coffin of a child. "The roof of the western chamber is supported on two semicircular ribs of 19 voussoirs each. The key-stones are the smallest, the haunch-stones the largest, as in Byzantine buildings. On these ribs, 15 feet span, and about 2 feet wide, the flat roofing slabs are laid in three rows of six each, north and south." In the photo below Yarden poses in front of the southern wall. 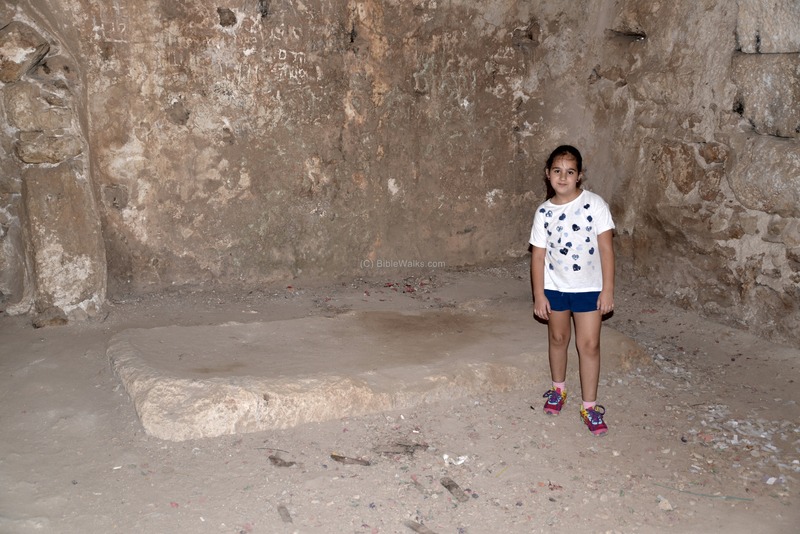 She really enjoyed visiting the site and nearby ruins of the Crusader fortress of Kuleh, and especially excited to fly the drone around the structure. A mihrab (Muslim prayer niche) is located on the eastern side of the south wall. The Muslim prayer niches are on south walls since they are oriented toward Mecca. The niche was added in a later period, covered with red plaster. It converted the Roman structure to a shrine dedicated to John the Baptist (called Neby Yahyah in Arabic). John, as other Biblical figures, are regarded as a prophet in the Muslim Quran. A graffiti of a Jewish Magen David was added on the cavity of the mihrab, an ugly act that is regrettable. 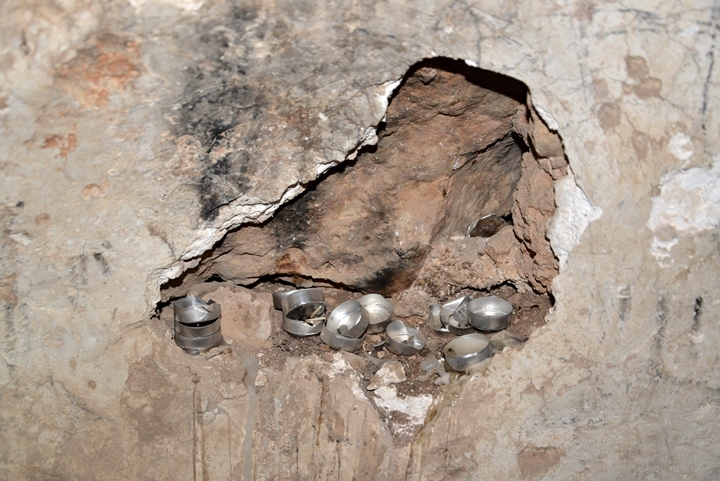 A hole on the western wall is a place where ritual candles are placed and lit. It seems like some people still come here to light candles and come to pray or request favors. 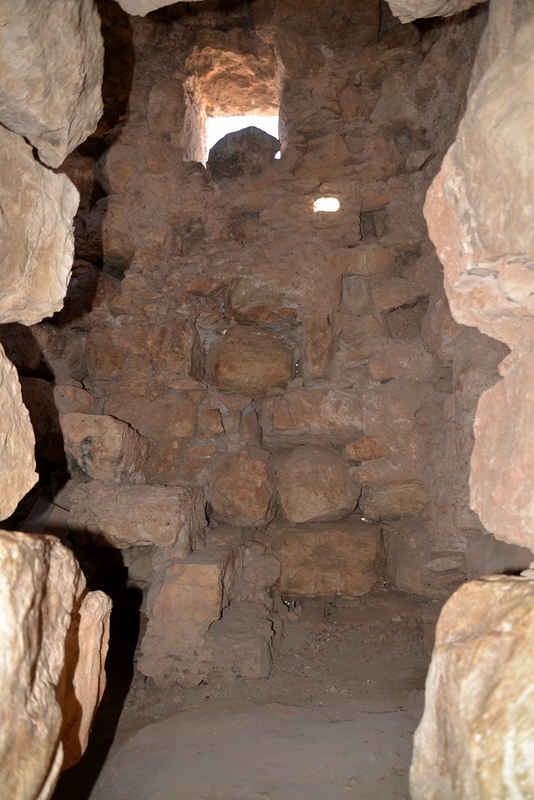 A high opening on the eastern wall leads to a second chamber. 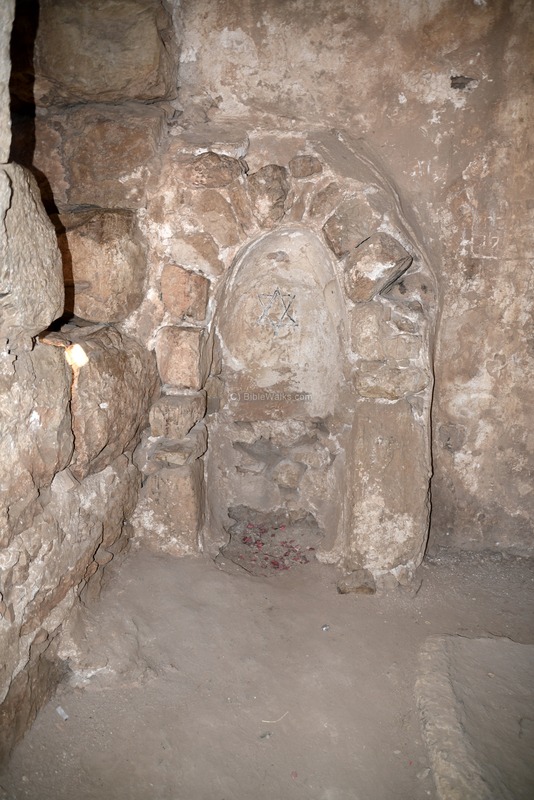 Inside the eastern chamber is a "columbarium" with several dozen square holes. The holes were used to store vases (urns) with the cremated remains of the diseased, probably the ashes of servants of the Mausoleum's owner. The word 'columbarium' is based on the Latin word columba ('pigeon'), as it was originally used for a place to house doves and pigeons. Since these storage places looked like the pigeon holes, these type of burial sites were also named columbarium. "A staircase leads up the east wall of the east chamber inside ; it consists of flat slabs built into the wall, of which seven remain. They lead up a height of 10 feet 10 inches to a window, of which there are three on the east wall of different heights. The rest of the staircase was, perhaps, outside, but there is also an opening to the roof on the north". The stairway leads up to the roof of the structure, through an inclined roof. The PEF report speculated that a second story was located above the structure. Another 4.2m by 4.2m square plastered cistern is located 16m away, on the north side. It is 3.6m deep, and was covered by stone slabs. The water was drawn from a shaft 4.5m to the south of the reservoir, that was connected to it by a tunnel. 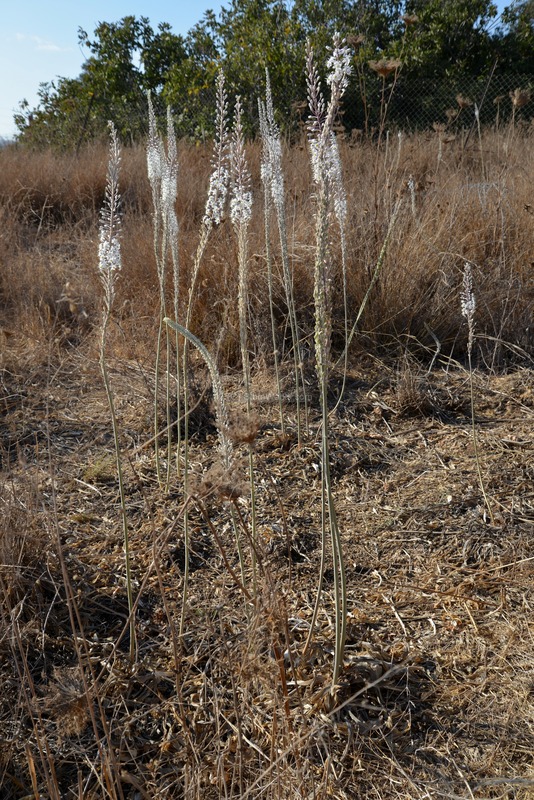 Near the structure we noticed a cluster of Hazav (squill, or: urginea maritima) flowers. They flower at the end of the summer (September/October), signaling the beginning of the Autumn season. Their bulbs were also used to mark the edge of a field or lot, an ancient practice that is widespread in the Holy Land. A legend even held that Joshua used the squill bulbs to mark the borders between the tribes. Makam en Neby Yahyah - The Arabic name of the Mazor Mausoleum. Yahyah - Arabic for: John the Baptist.